The new EVO3 Foundation will provide tech education to the youth of Summit County and provide tech services to other non-profits in the area. EVO3 Workspace, a unique coworking space in Frisco, Colorado dedicated to bringing tech to the mountains, is proud to announce its latest enterprise, EVO3 Foundation. The foundation is a newly formed non-profit organization that will focus on tech education for youth as well as fulfilling technology needs for other non-profits in Summit County. EVO3 Foundation will design community initiatives based on three core themes – youth education, advancement of the tech industry and complimentary tech services. The EVO3 Foundation will provide youth education through its 500 Students in 500 Days initiative. The 18-month program will teach children, ages 6 to 12, to code using curricula from Bitsbox. 200 students will undergo a five-week course on app development and another 300 will be given an hour of coding instruction. EVO3 Foundation will work closely with the Colorado Technology Association to support initiatives that promote the advancement of the technology industry and highlight the ground-breaking work being done by tech companies in Summit County. To further connect like-minded individuals, The Colorado Technology Association created the Colorado Tech Tour, a technology road trip which showcases the states most talented tech advocates. The tour will be rolling through Frisco on August 2nd to feature EVO3 Workspace. See a need, fill a need. The EVO3 Foundation will connect non-profits organizations in Summit County with skillful volunteers who can fulfill their technology needs from setting up a network to designing a website. EVO3 Workspace is a coworking space in Frisco, Colorado dedicated to diversifying the local economy by bringing tech to the mountains. The meaning of the name EVO3 Workspace was derived from the word evolution and represents the growth and advancement of the tech industry. The three in EVO3 represents the introduction of technology as the third industry in the area. Mining was the dominant industry in the 1860’s and tourism about 100 years later. 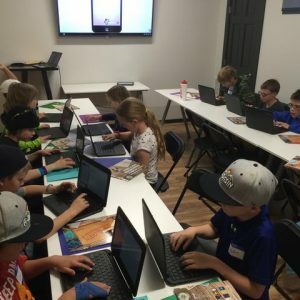 EVO3 Workspace is a leading provider of tech education and is committed to giving back to the communities in Summit County and beyond.